In a war between the humans and the inhabitants of the sea-humans will lose. Xanthus Dimitriou-the most lethal Dagonian to rise from the ocean-is on a mission to save mankind from annihilation. But first there's one small thing he needs to do... kill a beautiful young woman in a wheelchair. Killing her doesn't start out as part of his plan. He entrenches himself deep in the human world. Aligning himself with his enemies, he prepares to send them to Triton to face their punishment. Then Sara Taylor rolls onto the scene. Xanthus knows at once she's a criminal. And her crime? Being born. She's a human/Dagonian half-breed, an abomination. Killing her should be an easy job. All he has to do is break into her apartment, slit her throat, and feed her body to the sharks. Simple, right? Wrong. If only she weren't so beautiful, so innocent, so sweet... Saving the world may have to wait. It appears Xanthus has a woman to save. But protecting her may cost him his own life. This book was amazing!!! 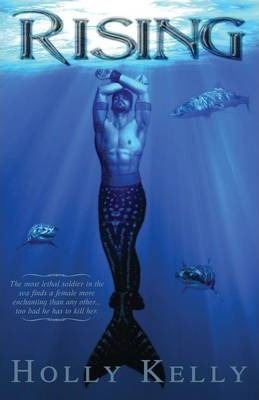 It was one of my favorite Mermaid books, it was more mature then most I have read and that I could relate based on where I am in my life. It was not mature in that it had sexual content, or profanity, it was very clean. It was just that the characters were a little bit older and that there were more struggles in their lives and more violent situations (that people living in poor neighborhoods or someone out at night alone might deal with). I loved the complexity of the characters in that they were multifaceted. Some of the characters struggle with themselves and are neither good nor bad. I love the romance and mythology that Holly Kelly has created in her story. The different races of underwater life was a great twist and it not just being Mermaids, was a wonderful addition to the book. The book starts with a woman giving birth to a baby that has deformation with her legs and they are fused together. There is also a war under water brewing as the waters have been polluted by the humans and the race called Dagonian's want to make them pay for killing some of them and ruining their homes. But Xanthus believes that these humans can be reasoned with and goes to the god of the under water and the last of the Mer people and asks him if he can live among the humans. He promises to make those who have caused the pollution pay to Triton and to see if he can then seek peace, but Triton only gives him a year to do this. When Xanthus is in Hawaii he notices a young women and he senses that something is different about her and immediately he knows that he shouldn't be drawn to her but he is. He knows that she should be killed for if she is discovered it could mean bad things for their kind and her living here is against the law. Xanthus decides to get close to her to try to find out her story, who is she, why is she here? He soon starts to question everything he has been trained to believe and questions his mission. He soon realizes that he would risk everything to be with her. I love this book, it is one of the best books I have read! It was well written, imaginative, not vulgar or to sexual, it was romantic and so full of fantasy and action. This was a great book for a man or a woman! Definitely a 5 out of 5 stars!! !